Two small rabbits, Mama Rabbit and Papa Rabbit, are introduced. A spectator holds Mama Rabbit in their closed hand, while Papa Rabbit disappears! Opening their hand the spectator discovers Papa has magically rejoined the Mama Rabbit. Now the spectator holds onto both Mama and Papa, as they tap the back of their hand saying the magic words. This time when they opens their hand, there are screams of amazement, because an entire family of 5 Baby Bunnies has magically appeared, joining the Mama and Papa Rabbits! 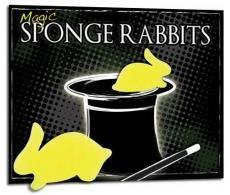 Have fun making these rabbits vanish from one hand and reappear in the other, and then multiply! Easy to learn and perform. Comes in beautiful packaging with bonus online video instructions. "People love and remember 'The Rabbits' long after they have forgotten routines that might take years to learn. 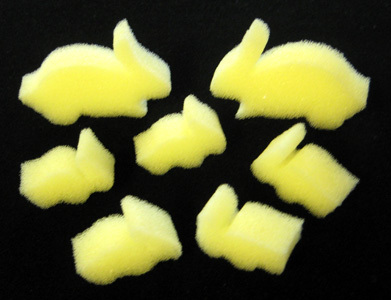 Cute, magical rabbits that appear inside the spectator's hand is such a fun idea, that the rabbits are possibly the greatest close-up trick of all time!" --Michael Ammar.